Winter squash (Cucurbita) seeds, including that of pumpkin, have health benefits. Pumpkin seeds are useful for lowering dihydrotestosterone (DHT), and are also useful against certain parasites. Curcurbita is the genus of plant referred to as squash. It belongs to the gourd (Cucurbitaceae) family, which includes watermelons and cantaloupe. Winter squash is defined by certain squash that is left to grow through more seasons to a larger size. Pumpkin is a winter squash that includes varieties of Cucurbita pepo, Cucurbita maxima and Cucurbita moschata. 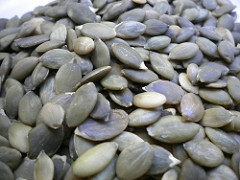 Shelled winter squash seeds have hormonal effects. They are useful for lessening the effects of dihydrotestosterone (DHT), by containing phytochemicals which bind to this potent androgen. However, pumpkin seeds also lower (aromatase) androgen to estrogen conversion. Pumpkin seed has an effect against hormone receptive cancer cells. Pumpkin seeds are useful against certain parasites. As an anti-wormer (anthlemintic), winter squash seeds have a limited effect against particular intestinal parasites. Seeds of Cucurbita pepo, Cucurbita maxima and Cucurbita moschata had an effect against some, but not all, types of intestinal worms. Towards certain species of intestinal worms, Cucurbita pepo harmed parasite development, ability, larva and eggs. Berberine and palmatine contained in Cucurbita pepo seeds have an effect against Toxoplasma gondii. However, there is uncertainty as to how effective Cucurbita is against this parasitic protozoa. Saw Palmetto (Serenoa), oatmeal (Avena), Nettle (Urtica) and Prunus (including pygeum) also have anti-DHT properties, as well as anti-aromatase properties. Anti-aromtase properties are usually not needed in large quantities for breast enhancement. These herbs are typically mentioned for male health. super-bazongas.pdf continues about herb use, including the potential role of Cucurbita, in a herb schedule for breast enhancement. Herb timing and combinations' success for breast enhancement relies on menstrual phases. See programs for examples of herb combination use, and for pictures of successful herbal breast enlargement. The role of Cucurbita pepo in the management of patients affected by lower urinary tract symptoms due to benign prostatic hyperplasia: A narrative review. https://www.ncbi.nlm.nih.gov/pubmed/27377091. Pumpkin seed extract: Cell growth inhibition of hyperplastic and cancer cells, independent of steroid hormone receptors. https://www.ncbi.nlm.nih.gov/pubmed/26976217. Evaluation of Anthelmintic Activity and Composition of Pumpkin (Cucurbita pepo L.) Seed Extracts—In Vitro and in Vivo Studies. https://www.ncbi.nlm.nih.gov/pmc/articles/PMC5037735/. The Plant List: Cucurbita. 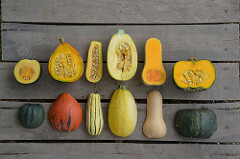 http://www.theplantlist.org/1.1/browse/A/Cucurbitaceae/Cucurbita/.